2 7 w w w. s p i r i t o f w o m e n . c o m FA L L 2 015 S P I R I T O F W O M E N SHUTTERSTOCK Y ou're running late. You dive into your bedroom closet for a top to match your skirt and resurface with a dozen rumpled black T-shirts that are definitely not navy, which is what you really need right now. You've got a bad case of closet clutter. And you undoubtedly know what the cure is—it's just a matter of finding the time and the will to administer treatment. Fortunately, closet organizing doesn't have to be overwhelming, say professional organizers. In fact, you can do it in a day or a little at a time, engaging a trusted friend or a pro for support. "Some people find it mentally exhausting to clean a closet in one day," says Amy Trager, a Certified Professional Organizer (CPO) in Chicago. But however much time you allot to the task, she says, you'll want to figure out what you have, weed out what you don't need and decide how to arrange what you keep. GETTING STARTED Although professional organizers may take different approaches, they all suggest you begin by removing things from your closet. "Ideally, I would start by pulling everything out," says Trager. That way you get a better idea of how much space you have and what's actually lurking there. After you empty the closet, Trager recommends separating the clothing into categories, such as blouses, T-shirts, jeans, dress pants, etc. "It's easy to see what you have when you have the category to go through. You can see that you have six pairs of pants but you only need two," she says. MOVING ON As simple as it seems, deciding what stays and what goes can be challenging, say organizers. That's where it's beneficial to have another person help you decide what looks good, says Hudson Valley, N.Y.-based Linda Samuels, CPO, president of the Institute for Challenging Disorganization. 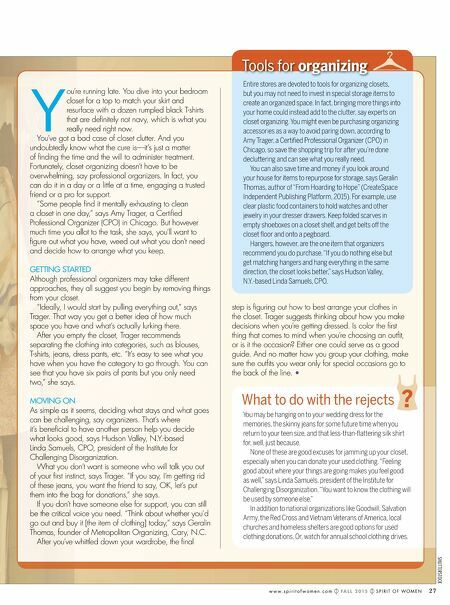 What you don't want is someone who will talk you out of your first instinct, says Trager. "If you say, I'm getting rid of these jeans, you want the friend to say, OK, let's put them into the bag for donations," she says. If you don't have someone else for support, you can still be the critical voice you need. "Think about whether you'd go out and buy it [the item of clothing] today," says Geralin Thomas, founder of Metropolitan Organizing, Cary, N.C. After you've whittled down your wardrobe, the final step is figuring out how to best arrange your clothes in the closet. Trager suggests thinking about how you make decisions when you're getting dressed. Is color the first thing that comes to mind when you're choosing an outfit, or is it the occasion? Either one could serve as a good guide. And no matter how you group your clothing, make sure the outfits you wear only for special occasions go to the back of the line. • You may be hanging on to your wedding dress for the memories, the skinny jeans for some future time when you return to your teen size, and that less-than-fattering silk shirt for, well, just because. None of these are good excuses for jamming up your closet, especially when you can donate your used clothing. "Feeling good about where your things are going makes you feel good as well," says Linda Samuels, president of the Institute for Challenging Disorganization. "You want to know the clothing will be used by someone else." In addition to national organizations like Goodwill, Salvation Army, the Red Cross and Vietnam Veterans of America, local churches and homeless shelters are good options for used clothing donations. Or, watch for annual school clothing drives. Entire stores are devoted to tools for organizing closets, but you may not need to invest in special storage items to create an organized space. 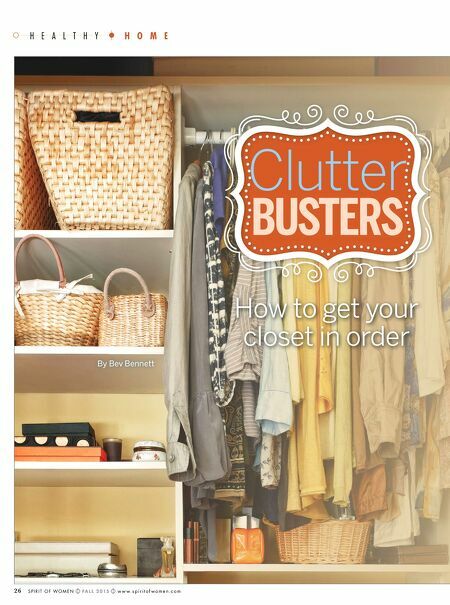 In fact, bringing more things into your home could instead add to the clutter, say experts on closet organizing. You might even be purchasing organizing accessories as a way to avoid paring down, according to Amy Trager, a Certifed Professional Organizer (CPO) in Chicago, so save the shopping trip for after you're done decluttering and can see what you really need. You can also save time and money if you look around your house for items to repurpose for storage, says Geralin Thomas, author of "From Hoarding to Hope" (CreateSpace Independent Publishing Platform, 2015). For example, use clear plastic food containers to hold watches and other jewelry in your dresser drawers. Keep folded scarves in empty shoeboxes on a closet shelf, and get belts off the closet foor and onto a pegboard. Hangers, however, are the one item that organizers recommend you do purchase. "If you do nothing else but get matching hangers and hang everything in the same direction, the closet looks better," says Hudson Valley, N.Y.-based Linda Samuels, CPO. Tools for organizing What to do with the rejects ?